In immunohematology, we often encounter reactions which are not due to blood group antibodies while typing red cells, compatibility testing, or antibody screening. If a patient has an antibody that reacts with a chemical present in the commercial red blood cell (RBC) suspension, anti-sera, or potentiators (low ionic strength solution), it can lead to serious errors or incompatible crossmatches or delay in supplying blood for transfusion. Antibodies are reported against various chemicals added to the reagents, for example, antibiotics, antifungal, sugars, and dyes. Various manufacturers add antibiotics to the red cell suspension media. Antibodies to chloramphenicol, neomycin sulfate, gentamicin, etc., have been reported. We present here a rare case of anti-co-trimoxazole drug-induced antibody detected during routine antibody screening. A 36-year-old female admitted with complaints of generalized weakness and headache for 3 days for revision of ventriculoperitoneal shunt surgery. She was a known case of hydrocephalus, aseptic meningitis, and was on regular antiepileptic, antidepressant and antiosteoporotic medications. On admission, her hemoglobin was 11.5 g% and a type and screen request was received by the blood bank. Blood group was confirmed as A Rh (D) positive. Her serum was screened for irregular antibodies using commercial three-cell antibody screening panel (ID Diacell I-II-III, Diamed Cressiur sur Morat, Switzerland) and showed a pan-reactive 4+ reaction in AHG phase with negative autocontrol. 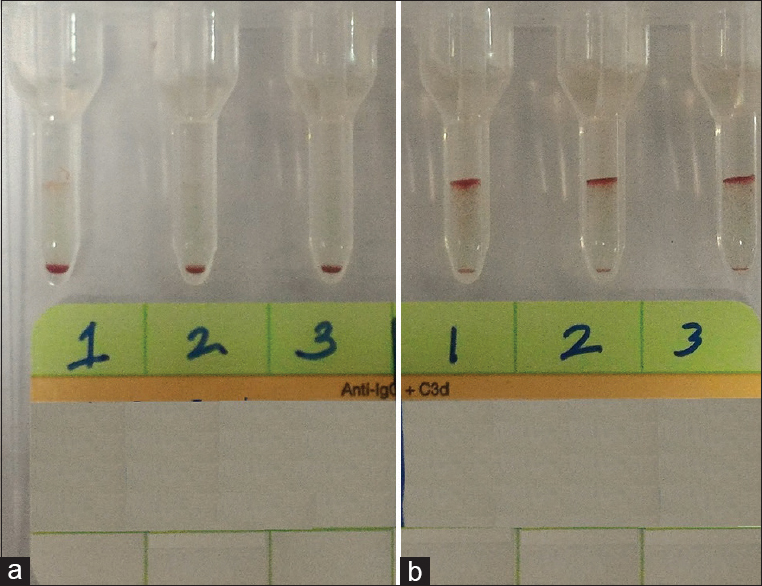 Antibody identification using ID-Diapanel (Diamed Cressiur sur Morat, Switzerland) showed 4+ pan-reactive reaction with all 11 panel cells with negative autocontrol giving suspicion of antibody against High Frequency antigen (HFA) [Figure 1]. The direct antiglobulin test using anti-IgG and anti-C3d were negative. The neurosurgery team was explained about the positive antibody screen and possibility of antibody against HFA. To further characterize the nature of antibody against HFA and to rule out anti-IH antibody with wide thermal amplitude, patient serum was further tested for cold antibody screen using ID-DiaCell I-II-III (Diamed Cressier sur Morat, Switzerland) in saline phase which showed pan-reactive 4+. On crossmatching with group specific (A RhD positive) packed red cells using LISS/Coombs gel card and were found to be compatible raising suspicion against Anti-HFA. The crossmatches and indirect Coombs tests (ICT) were repeated with tube method which showed negative results giving a first suspicion for anti-preservative red cell antibody. The patient sample was also tested with commercial screen cells of different manufacturers (Surgiscreen cells using Glass bead method, Ortho Clinical Diagnostics; Matrix Erygen AS reagent red cells; Tulip diagnostics). The ICT results with other commercial red cells were nonreactive. The antibody preservative in commercial reagent red cells and antibody screen results with patient serum are shown in [Table 1]. The preservative present in ID-Diacell I-II-III (Bio-Rad Laboratories) is the antibiotics trimethoprim (TMP) and sulfamethoxazole which were absent in surgiscreen reagent red cells (Ortho Clinical Diagnostics) and Matrix Erygen AS reagent red cells (Tulip diagnostics). To confirm the nature of drug (anti-preservative)-induced antibodies, reagent red cells were washed thrice with saline and ICT was repeated which came negative with washed reagent red cells [Figure 2]. However, after prolonged incubation of washed reagent cells in ID-Diluent 2 (LISS solution) as well as BLISS solution (Ortho Clinical Diagnostics), ICT was showing weak reactive (1+). Furthermore, on incubating the in-house donor red cells with BLISS solution for 30 min in room temperature, the crossmatch with patient serum showed 1+ reactive. On reviewing the manufacture inserts, ID–Diluent 2 as well as Ortho BLISS solution for red cell suspensions had preservatives, the antibiotics TMP and sulfamethoxazole (SMX). There was no history of recent intake of drug though the history of intake of drug could not be asserted. It was confirmed to be an anti-co-trimoxazole drug-induced antibody against preservative media in reagent red cells. There were no clinical features of hemolysis. Blood transfusion was not required during surgery. The patient and the physician were explained regarding potential risk of hemolysis if the same drug is taken. The possibility of co-trimoxazole drug-induced aseptic meningitis also could not be ruled out. The patient was discharged with stable status with proper advice. During immunohematological workup, whenever an ABO discrepancy is encountered or when a patient's serum reacts with all RBC's, often presence of an antibody to a blood group antigen is assumed. This case highlights that these reactions can be unrelated to blood group antigens. In blood banks, we routinely use commercial anti-sera, commercial RBC suspending media, commercial antibody potentiators, and commercial RBC panels. These reagents often have preservative or antibiotics such as chloramphenicol, neomycin sulfate, and gentamycin. The presence of antibodies to a given drug may lead to a positive result when performing antibody identification. The presence of antibodies against a preservative drug can be assessed only when patient's serum containing antibody is added to RBCs in the presence of antibiotic (i.e., the commercial RBC suspension media). We demonstrated that serum containing antibodies against co-trimoxazole gave positive reactions with commercial panel cells with the preservative as co-trimoxazole but negative reaction with other commercial RBC panels without the same drug as well as with native or washed red cells. Antibiotics TMP and sulfamethoxazole was present in ID-DiaCell I-II-III (Bio-Rad Laboratories) reagent red cells as well as LISS and BLISS solution. However, the variation of concentration of these antibiotics (not mentioned in manufacturing inserts) may have caused the difference in reaction while repeating ICT using reagent red cells without co-trimoxazole (Ortho Clinical Diagnostics). Reagent red cells (Biorad) which were already suspended in drug were causing high grade of reaction (4+) which were turning negative after saline wash whereas LISS and BLISS solution required prolonged (more than 30 min) incubation of reagent red cells with these diluents before adding serum to get low-grade (1+) positivity which explains negative results with Surgiscreen red cells during antibody screen. In Pham et al., where 3 cases were reported against subjects produced antibodies against co-trimoxazole in three different patterns: Antibodies to both co-trimoxazole components (antibodies against TMP and SMX) or against one component only. In his study, anti-TMP antibodies gave negative reaction with Ko RBCs, showing anti-Ku specificity in 2 cases and anti – SMX antibody with anti-H specificity in one case. LISS solution without co-trimoxazole could not be used as suggested by Pham et al. Our case report shows that antibodies against co-trimoxazole can present as antibodies against a high-prevalence antigen which was in accordance to other studies., Further specificity analysis could not be done in our case due to unavailability of panel of RBCs lacking a high prevalence antigen. Different pattern of antibody reactivity is reported by Arndt's et al. and suggests that the immune response by a given drug may vary in patients exposed to drug and is governed by many factors. The drug-induced antibodies may recognize different RBC components and differ in blood group specificity; therefore, it is important to know the formula of media used in reagents and laboratories to interpret the data correctly. These anti-preservative antibodies should be assessed carefully, and despite the absence of clinical events, the avoidance of drug should be recommended. The clinical importance of antibodies against co-trimoxazole is not yet clear. These antibodies have shown to be associated with hemolytic anemia, renal failure, aseptic meningitis. Although we did not find any clinical or biochemical signs of hemolysis in the patient, we advised to avoid the use of co-trimoxazole as these antibodies have been associated with drug-induced immune hemolytic anemia and renal failure. Finally, these antibodies might be a serological finding only. Further investigations and follow-up required for confirmation of drug-dependent antibodies and associated hemolytic anemia and nature of these antibodies. We thank Dr. Dhinesh Kumar, HOD, Department of Transfusion Medicine, Billroth Hospital and Dr. K. Cheirmaraj, Technical support, Ortho Clinical Diagnostics for their help in the study. Garratty G.In vitro reactions with red blood cells that are not due to blood group antibodies: A review. Immunohematology 1998;14:1-11. Hysell JK, Gray JM, Hysell JW, Beck ML. An anti-neomycin antibody interfering with ABO grouping and antibody screening. Transfusion 1975;15:16-22. Beattie KM, Ferguson SJ, Burnie KL, Barr RM, Urbaniak ST, Atherton PJ. Chloramphenicol antibody causing interference in antibody detection and identification tests. Transfusion 1976;16:174-7. Peloquin PM, Hawkes D, Mayers S. An IgG, gentamicin sulfate-dependent antibody found during prenatal antibody screening. Vox Sang 1986;51:321-3. Petz LD, Garratty G. Immune Haemolytic Anemias. 2nd ed. Philadelphia, PA: Churchill Livingstone; 2004. Salama A, Mueller-Eckhardt C. On the mechanisms of sensitization and attachment of antibodies to RBC in drug-induced immune hemolytic anemia. Blood 1987;69:1006-10. Arndt PA, Garratty G, Wolf CF, Rivera M. Haemolytic anaemia and renal failure associated with antibodies to trimethoprim and sulfamethoxazole. Transfus Med 2011;21:194-8. Ermis B, Caner I, Karacan M, Olgun H. Haemolytic anaemia secondary to trimethoprim/sulfamethoxazole use. Thromb Haemost 2003;90:158-9.